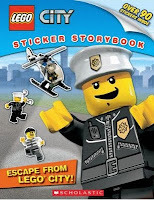 This is the first Lego City Sticker book, Escape from Lego City. Four prisoners have escaped from jail and as they disperse across the city; you help create the story through the use of over 90 stickers. Each page is a photo of a scene in Lego City constructed from real Lego. 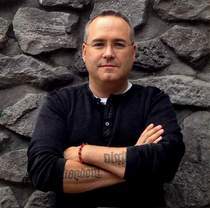 Each page also has between 4 and 12 stickers that you choose where to add, to help tell the story. With 16 pages to the story and the large format it will be fun to read and to help finish illustrating with the stickers. It is bound to be a hit with young readers.